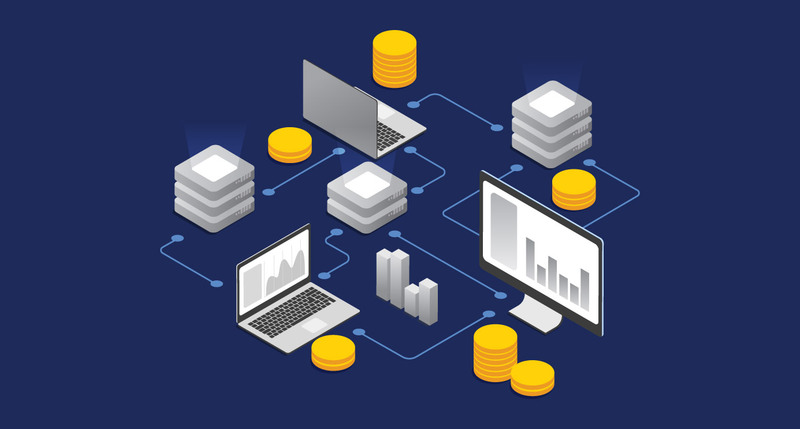 Dealing with market intelligence for financial services means extreme number crunching and the creation of data points which need to be translated and distributed as meaningful information. This makes timely and precise information-sharing critical and indispensable. Keeping up with fast-paced, dynamically evolving needs becomes a challenge with outdated, custom-built solutions. The client, a New York based Fortune 500 financial services firm, realized that it was no longer sustainable to continue with their custom-built, legacy, non-Drupal system. Their in-house team was in search of a partner who could recommend a quicker solution, one that was easily adaptable and could be implemented with limited customizations in a short timeframe. Axelerant has been a top contributor to Drupal adoption success for more than a decade now. And the team’s Drupal implementation experience allowed them to accurately gauge what would work for the client. They collaborated with their partners and the client’s team, leveraging Drupal’s core strengths and their own maturity and agility with a consultative approach. Their short-term objective of designing, implementing, and delivering a minimum viable decoupled Drupal re-platform was achieved within scope, budget, and timelines. The change content delivery requires at scale is accelerating. Where there is the need for new, more dynamic content publishing, there is the need for constant change and adaptation. The way end-users consume information is dynamically evolving. The end-to-end process—the content journey from content ideation to creation to distribution and consumption—has become far more efficient. The existing system, built several years ago by the client, hadn’t advanced to cater to the needs of modern day content editors, distributors, or consumers. And it was becoming increasingly difficult to maintain the system due to operational costs added by poor design and redundancy. The solution lacked standardization and modularization, forcing the client’s team to recreate and redistribute market intelligence reports in the form of PDFs every time there was a fresh report or a change to an existing report—straining their team with a dead-end process from yesterday. Considering the volume at which Fortune 500’s operate, this meant a substantial amount of time and costs were consumed, leading to large scale operational inefficiency. What is more, all of this information needed to be easily accessible and digitized on the web in multiple places, not just available as standalone PDF reports. This need drove the team to think of a more efficient solution that could simplify the process of creation and distribution of financial services data and market intelligence reports. This solution needed to be simple, scalable, and user-friendly. It also needed to be seamless and cost-effective, and to allow the client to standardize and eliminate redundancies. Why was Drupal 8 the right choice? With its powerful suite of tools offered in off-the-shelf solutions for large and ambitious projects, our choice was clear: Drupal 8. We needed to convince the client that Drupal 8 would not only be the strongest link in their content supply chain, but could also interact with countless applications, thanks to its REST-first native web services. The client could leverage Drupal 8’s progressive decoupling to break free from back-end restrictions, without sacrificing security and accessibility. The development and delivery would also be faster, with enhanced entity caching and better integration with CDNs and reverse proxies. Drupal 8 also offers the client greater flexibility, making it possible to build almost any integrated experience one can imagine. This was especially important, as there were third-party integrations involved in their content distribution chain. Together we discovered a clearer, success-focused roadmap for growth. To visualize the required feature set in Drupal and frame the solution, an analysis of the existing solution and top-down incremental requirement gathering proved useful. The team tried to break down each story into several smaller user stories for development. This helped lay down a very clear roadmap for implementation, and highlighted risks early on. This process required a mix of experience with Drupal and out of the box thinking. Time zone differences added a degree of complexity to the project, as collaboration was needed between onshore and offshore team members to groom all desired epics. The team was proactive and asked the right kind of questions to ensure extensive grooming was done to get the solution right. As is the case usually, because the client had gotten used to a custom-built system over the years, it was challenging to get them accustomed to a CMS that demanded a certain level of standardization. Standardization required tweaking the current business process to fit the CMS, whereas in the past, with their custom-built system, it was the system that was tweaked. With requirements evolving continuously, the project teams from both ends had to collaborate proactively to complete a detailed impact analysis before going ahead and writing the code. Confidence building had to run through agile-driven, iterative delivery. As the Axelerant team was new to the engagement and unfamiliar with the subject matter initially, they began with a focused, consultative approach. This would help them ensure that they were aligned with the client side product owners in terms of understanding the problem statement as well as what outcomes would mean success for them (both short term and long term). After initial discussions with the end-client, who was not familiar with Drupal, it was clear that the primary challenge was to convince the stakeholders about Drupal being the right fit, long-term solution. It was also important at this early stage in the engagement to demonstrate the team’s competence as consultative partners. The team needed to validate that all existing capabilities met through the legacy system could still be met by the proposed Drupal solution. The development and implementation also needed to be time-boxed and iterative for the client to derive value early and “fail fast”. The team shifted gears to adopt an agile-driven iterative delivery model as an effective way to demonstrate the value of the proposed solution early in the engagement, as well as the competence of the developers. The key short-term goal was decided: a minimum viable product (MVP) version that could establish Drupal’s capabilities as a better alternative to the existing system, and allow key users from the client team to be trained in using Drupal. The first version (MVP) came out in a matter of just 12 weeks. The team developed and delivered a Drupal-based portal to manage the content for the market intelligence reports and their distribution, replacing the client’s custom-built system. Now they create compelling content with full control over workflows. Reusable templates and a publishing workflow were built for better control and oversight of content. The new site is able to publish reports and report list information for other systems to consume (like their corporate site, Salesforce, etc. ), and content is made available to end-users easier, faster, and with a modern process. Using Drupal as a CMS, Axelerant helped the client move away from the PDF and email-driven approach and towards web content, which is more accessible, and allows integration with and publishing of the same content to various third parties in Salesforce Communities. Each template and report is now standardized and reusable, enabling the client to save both time and effort. 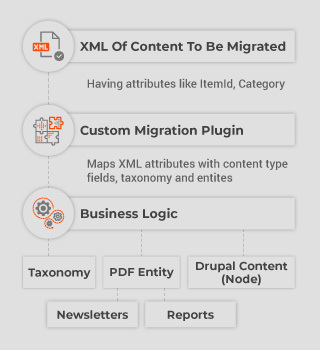 The decoupled Drupal 8 implementation drastically simplified content creation for editors. It allows them to create compelling content, work more efficiently with better previews and drag-and-drop image uploads, choose in-context editing, and use only the tools they need for editing, to name a few highlights. "Excellent solution, team of thinkers, code quality, attention to detail, very communicative—the team was able to come up to speed quickly, had familiarity with the tools and process they proposed, and produced great quality work." We produced a quality solution, backed by a team they could trust. With continuous collaboration with the product owner right from sprint planning to reviews and exhaustive demo scripts, Axelerant enabled the client to gain more familiarity with Drupal as a platform. As the project progressed, the client gained clear visibility into how the requirements were being mapped in Drupal. With most user stories being accepted with little or no significant changes, Axelerant was able to gain the client’s confidence in not only Drupal as a platform but also in the solution being created. Out of 45 user stories delivered to user acceptance testing (UAT) at the end of the project, 44 were accepted by the client, indicating the strength of the solution and quality of delivery. Upon requesting feedback, the client provided the team with a Net Promoter Score (NPS) rating—indicating the client’s satisfaction levels—of 10 out of 10. Key success factors that helped the Axelerant team enable the client to roll out an MVP that could be used as a baseline for the creation of other systems were proactive and open communication, and detailed impact analysis. Every challenge was always broken down and looked at through a problem-solving lens to help resolve it and arrive at an agreement. Although Drupal is the primary content creation and management layer, the content distribution was to be managed by the interaction of Drupal with two other independent non-Drupal third-party systems (i.e. Decoupled). With our Drupal development team, we helped define new standards for the content creation and presentation layer, distribution path, and leveraged all of the RESTful Drupal capabilities. The client uses multiple systems that interact with each other to manage and distribute content. The same set of users use these systems, with all users centrally managed with ease of use. With SSO, users can now log in to Drupal without having to manage multiple usernames and passwords. All users accessing the admin console are authenticated with the client’s Security Assertion Markup Language (SAML) identification provider. It provides both ease-of-access as well as protection against any potential security breaches. The nature of content in financial services is sensitive, and requires a high level of accuracy. Also, with a global presence, the client needed the content to be translated into multiple languages. A number of roles contribute to the creation, management, and distribution of this content. For example, Authors, Editors, Compliance Reviewers, and Translators come together to flesh out the final piece of content. Using role-based access control for users ensures that each user is totally clear about their content responsibilities, preventing unauthorized usage of sensitive data. The client is a global player with financial services in more than 70 categories across countries. More than 20 report types are generated across eight time frames (daily, weekly, etc) by a team of around 300 analysts. The legacy system had close to 1,60,000 PDF reports that needed to be present in the new system as well. Variables such as categories, byline authors, report types, etc, were migrated to ensure the system was ready with necessary information to start plugging in content. The existing PDFs were migrated—close to 3600 PDFs at a single time—from Azure as Drupal content (PDF Media and Article) and tagged with appropriate taxonomies such as category, report type, and timeframes. Content and media usage needed to be on time and correct, and also needed to adhere to legal compliances to be effective for the company. To ensure that reliable and accurate information is given to users, each piece of content needed to pass through a governance stage. The usage of media such as banner ads, images, and videos also needed to be in compliance with legal policies. Two separate workflows were created for content and media, and mapped to user roles. This helped eliminate bottlenecks and confusion, enabling content delivery on time, without any inconsistencies and errors. Drupal is the primary content management layer. The distribution of the content was to be managed by interaction of Drupal with other third party systems which would consume APIs created by the CMS. These APIs would carry content from Drupal to the external systems. The access to fetch content using JSON APIs was restricted to an “API viewer”. 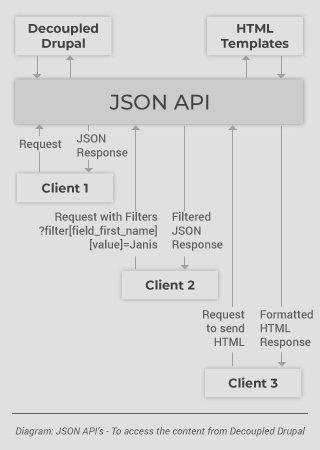 JSON APIs were created to enable the new system to fetch data from Drupal using various parameters and filters. These included fetching content by categories, report types, and languages. A custom endpoint was also created to return the serialized HTML content of the Drupal Article node in JSON format to be consumed by the new system.